We manufacture Polycarbonate Stickers which are a popularly used variety of signage’s. It is effectively produced on the materials of construction such as paper, poly carbonates, polyester, acrylics, etc. The polycarbonate and polyester labels are extremely economical and effective means of instruction and information exchange. 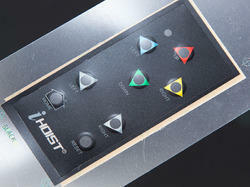 We are engaged in providing Polycarbonate Sticker. We offer them with high quality polycarbonate. We provide customized solutions at affordable rates. These have outstanding thermal and physical properties and find their usage in different industries. 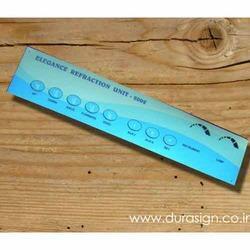 We are engaged in offering Front Facia Polycarbonate Stick that are manufactured from premium quality polycarbonate. Offered stickers come with excellent thermal and physical properties and thus can be used in a large number of industrial applications. We provide these stickers in multiple colors and varied shapes and sizes, so as to cater to the diverse requirements of our clients. 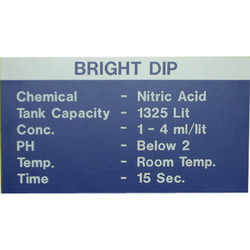 We are one of the leading manufacturers and suppliers of Instruction Stickers, which are used to indicate different instructions at offices and industries. 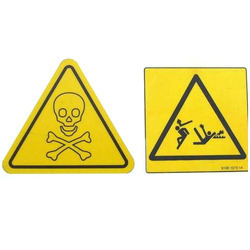 These stickers are highly beneficial to depict various signs of danger and caution and prevent any life threatening situations. 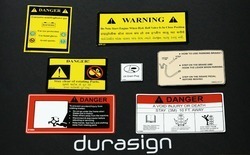 Made available in different shapes and dimensions, these stickers are offered at industry leading rates. Rating Sticker, offered by us, is manufactured from supreme quality polycarbonate and provided in different designs, patterns and sizes. These stickers are widely used to rate different properties in chemical and other industries and are well known for having excellent physical and thermal properties. We provide these stickers at market leading rates to our vast range of customers. We manufacture Polycarbonate Stickers which are a popularly used variety of signages. It is effectively produced on the materials of construction such as paper, poly carbonates, polyester, acrylics, etc. The polycarbonate and polyester labels are extremely economical and effective means of instruction and information exchange. Looking for Polycarbonate Stickers ?